Historic Blarney Castle is most famous for its stone, which legend tells has the power of conferring fluent or persuasive speaking or writing on all who kiss it. The stone is set in the wall below the battlements and, to kiss it, one has to lean backwards while grasping an iron railing, from the parapet walk. In the grounds of the castle the Rock Close and its surroundings is a fascinating place of ancient trees and far more ancient stones which is believed to be a garden of druidic origin and a center of worship in pre-Christian days. The place has an aura of magic and mystique with Wishing Steps, Witch's Kitchen, Druid's Cave and many other delights telling a story of centuries past. 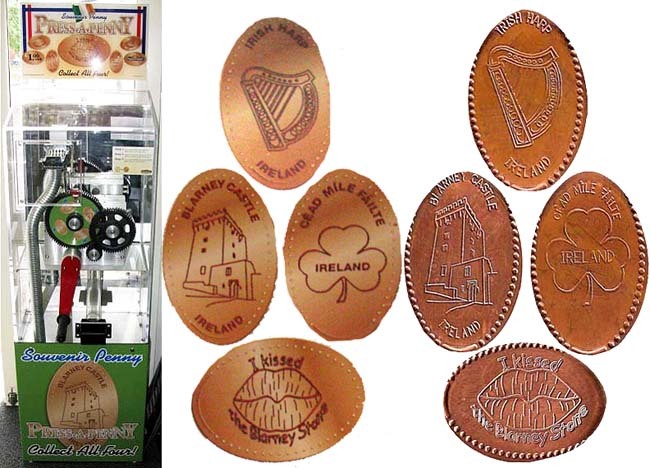 The Erin Gift store of Blarney, County Cork, just outside the entrance to the world famous Blarney Castle, sells a wide range of products such as Celtic jewelry, hand knit Aran sweaters under the Erin Knitwear label, Guinness official merchandise, Celtic themed mugs and Irish souvenirs. You will also find a selection of beautiful woolen throws. The store is open 7 days a week 9:00 am to 17:00 (5:00 pm). Plenty of parking for a fee. The euro machine is located inside by the back door/side entrance. 1. (V) An Irish harp with 'Irish Harp Ireland'. 2. (V) The Blarney Castle with 'Blarney Castle Ireland'. 3. (V) A shamrock with 'Céad Míle Fáilte Ireland' (A hundred thousand welcomes). 4. (H) A pair of lips with 'I kissed the Blarney Stone'. G.P.S. coordinates: Latitude: N51° 55' 54.6882" Longitude: W8° 34' 4.7532"